Allie Crawford has the life she always dreamed of - she's number two at a high-profile PR firm; she has two kids she adores; and her husband, Wade, is handsome and heroic and everything she thought a man was supposed to be - running a successful news magazine and, best of all, he provides the stable yet exciting New York City life Allie believes she needs in order to feel secure and happy. But when Allie finds Wade locked in their laundry room with a stunning blonde in snakeskin heels, a scandal ensues that flips her life on its head. And when an old flame calls, a new guy gets a little too close for comfort, and the woman wants to befriend Allie, she starts to think her marriage is more of a facade than something real. Maybe she's fallen in love not with Wade - but with the idea of him. 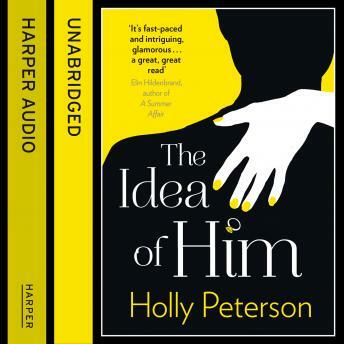 Captivating and seductive, told in the whip-smart voice of a woman who is working hard to keep her parenting and career on track, The Idea of Him is a novel of conspiracy, intrigue, and intense passion - and discovering your greatest strength through your deepest fears.